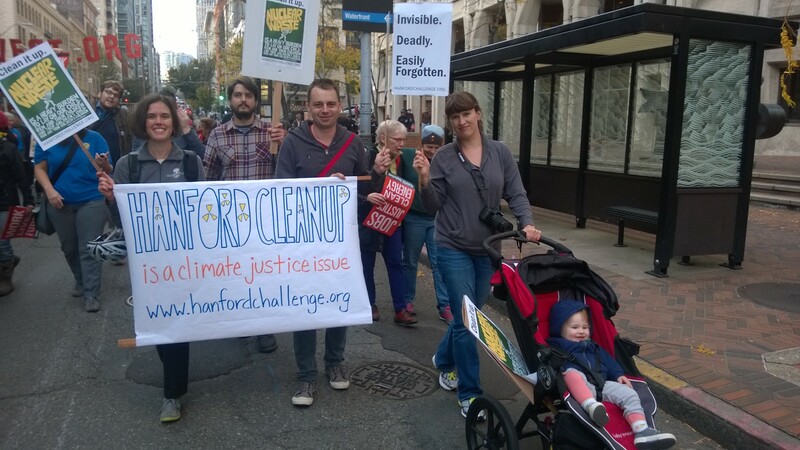 What is the link between Hanford and climate justice, you ask? We could go on for hours. But we’ll try to keep this short and pick a few examples of the most significant intersections. 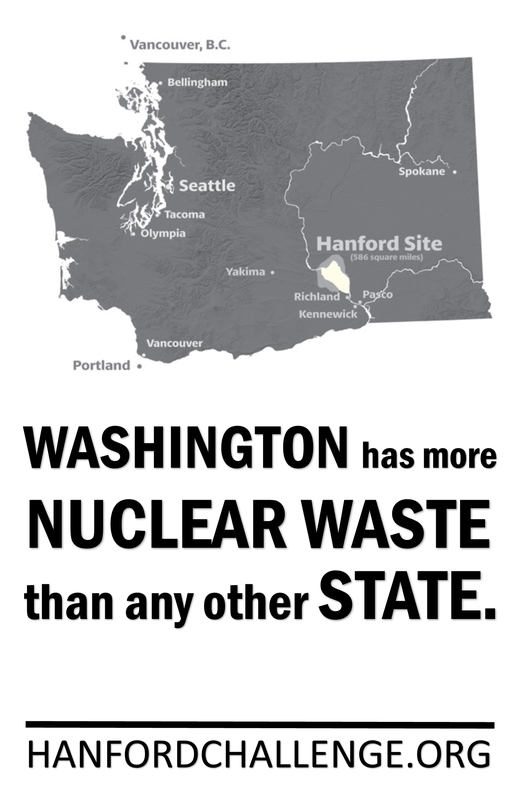 The 586‐square‐mile Hanford Nuclear Site is where the US government produced plutonium for nuclear weapons from World War II through the Cold War and is located on the mighty Columbia River. There are nine former nuclear reactors on the shores of the river which are in various stages of decommissioning and cleanup. Millions of gallons (seriously many millions of gallons) of radioactive liquid were dumped directly into the soil at Hanford. While many more millions of gallons of nuclear and chemical waste have the potential to leak into the ground and groundwater from aged high-level nuclear waste storage tanks. Boxes, barrels, and other containers of nuclear waste were dumped in trenches throughout the site. This stuff is going to be around for a while, a long while. For example, the half-life of plutonium is 24,000 year. Although the federally owned Hanford facility is no longer in active production, an impressive amount of work continues, day and night. Current work involves, just to give a few examples, constant monitoring of nuclear waste tanks, environmental remediation, transferring waste to more stable, protective locations, and building a large treatment facility (the Waste Treatment Plant) to hopefully, someday, turn Hanford’s liquid waste into a solid, glass form. There is also one operating nuclear power reactor near the Hanford Nuclear Site, the Columbia Generating Station, a General Electric, Mark II, boiling water reactor and, like many nuclear power plants, stores its used nuclear fuel rods in a spent fuel pool above ground not far from the river. We have to recognize that although we have no time to delay cleaning up the river corridor at Hanford, getting waste from Hanford’s aged and leaking tanks, remediating soil, trenches, groundwater, and containing old buildings, we will never fully “clean up” the Hanford site. Parts of the site will remain contaminated and require monitoring “in perpetuity.” We have no time to delay action to prevent the effects of climate change from intensifying. This is not a short-term issue, and it is not just one community that faces the impending consequences of climate change’s effect on the Hanford site, but many. As a direct example, the Hanford site sits on tribal lands, and their access to that land, along with their right to fish, hunt, and gather, are threatened by climate change as well as the waste challenges at Hanford which are exacerbated by climate changes. If you care about tribal communities, the communities downwind and downstream of Hanford or the health of the river, the air we breathe, and the water we drink and use to grow our food, then it is time to advocate for both Climate Action and Hanford Cleanup. There are also lesser known, but no less significant connections between Hanford, the entire nuclear weapons complex really, and climate change. The simplest connections between nuclear weapons facilities such as Hanford and the climate movement are in the Department of Energy’s history and budget. The Department of Energy was originally the Atomic Energy Commission. Simply put, the commission responsible for our energy policies was responsible for the Manhattan Project and remains responsible for nuclear weapons production and nuclear waste. 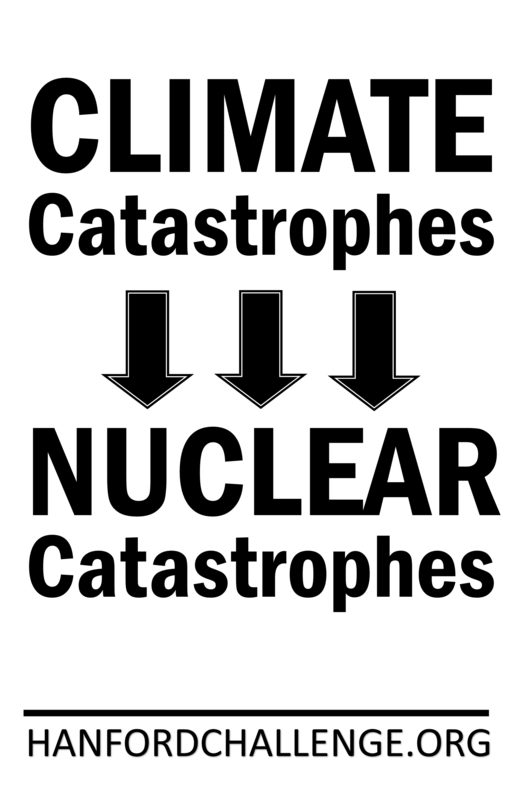 It’s time to tackle the problem of climate change and our energy future as well as the problem of nuclear waste without this conflict of interest. Well over half of the Department of Energy’s budget goes to “Atomic Defense Activities.” In 2014, 61% of Energy’s nearly $30 billion dollar budget was allocated to atomic defense, which includes weapons production and weapons facility cleanup. Also, the Department of Energy’s budget puts hundreds of millions more dollars towards nuclear power than renewable energy and efficiency combined. Again, this conflict of interest not only affects nuclear waste policy, but also affects energy policy which must be focused on moving us towards sustainability, efficiency, and a future without reliance of fossil fuels. If we want to see positive (rather than catastrophic) change at the Hanford site, we all need to pitch in to raise awareness and keep our lawmakers and cleanup regulators accountable for their responsibility to Hanford. As the great Dr. Seuss once wrote: “unless someone like you cares a whole awful lot, nothing is going to get better. It’s not.” There are many ways you can get involved with climate justice and Hanford cleanup. To start, like Hanford Challenge’s Facebook page to stay in-the-know on upcoming events, or follow this blog. Looking for something more intensive? We are always open to working with volunteers and interns to make positive change happen. Contact emilyp@hanfordchallenge.org for details.